When it comes to innovative gimbal designs, Freefly Systems and DJI are at the top of their class. The Movi M10 revolutionized filmmaking for a vast population of shooters (myself included) when it was released in 2013. Across the globe, DJI didn’t waste much time developing the original Ronin – DJI’s less expensive alternative to the popular Freefly handheld stabilizer. Last year’s release of the Freefly Movi Pro raised the stakes for videographers’ gimbal expectations, and DJI has answered the call with their powerhouse behemoth, the DJI Ronin 2. Each stabilizer offers its own flavor of professional, proficient machinery, so what can an operator expect from these competitors of a niche arena? The Movi Pro Handheld Bundle is the epitome of everything I’ve ever loved about the Movi line, optimized for professional use. Freefly deviated from the early Movi models’ clumsy, convoluted battery design that lacked built-in safety circuitry and incorporated dual hot-swappable batteries that are easily removed with one hand and discharge in the same amount of time it takes them to charge (approximately one hour). 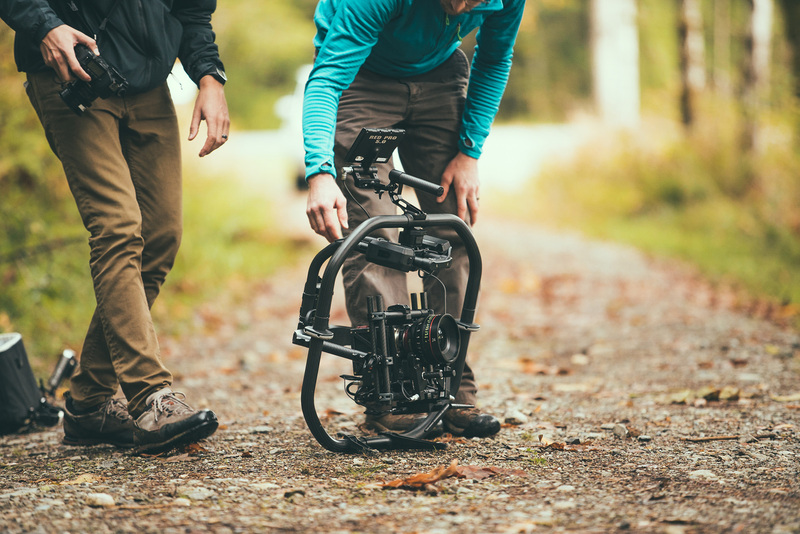 Equipped with an onboard monitor, the Freefly Movi Pro provides basic tuning and adjustment setting controls from the rear of the gimbal and amalgamated d-taps offer accessory and camera power solutions from dedicated d-taps. The optional Mimic and Bush Pilot accessories create a dual operator ecosystem that supports gimbal, camera (limited), and lens control from a compact, wireless hub. This re-engineered Movi uses Freefly’s popular Toad in the Hole quick release system to attach it to the Movi Ring Pro, an outer ring of 30mm tubing that functions as both a grip system for handheld operation and a gimbal stand for tuning or operator relief. Constructed of lightweight materials, the Movi Pro supports a fifteen-pound payload while contributing less than six pounds to the overall rig. The DJI Ronin 2 is one of the most capable, conscientious handheld stabilizers on the market right now. This beast of a gimbal features dual hot-swappable batteries with industry-topping performance, onboard monitoring with a menu interface supporting tuning and advanced adjustment settings, incorporated d-taps for the camera and accessory power, a redesigned remote, and camera integration. 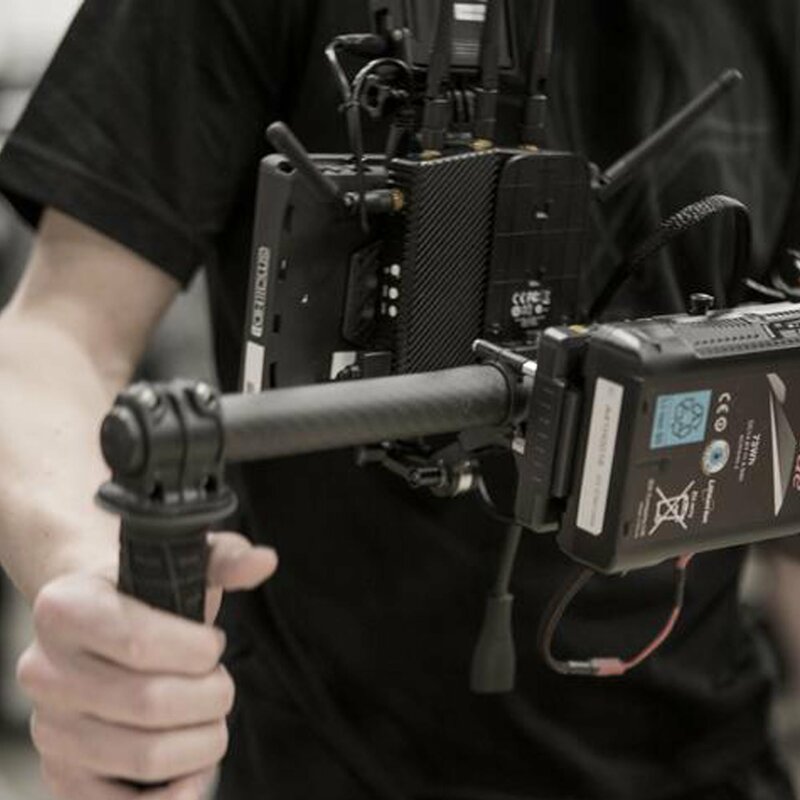 The Ronin 2 battery system is able to power the gimbal and camera up to 2.5 hours. Built-in SDIs provide a cable management solution that won’t clutter your rig, and a smart outer ring design that is comprised of two sections, allowing for a completely constructed tuning stand during setup and a lighter handheld stabilizer when the base is removed, DJI has proven that they know their audience. The expanded camera cage with axis balancing improvements and thirty-pound payload accommodates a wide range of large, high-end cameras and lenses, meaning fewer compromises when it comes to selecting the appropriate camera package. When you start talking about handheld stabilizers capable of supporting the weight of high-end cinema cameras and specialty lenses, it isn’t unusual to see one operator physically holding the gimbal and a second operator controlling difficult moves and managing camera controls, when applicable. The Original Movi’s Controller, despite all of its cutting-edge technology, was complicated, buggy from one firmware version to the next, and lacked the ergonomics of a simplified remote option like the Spektrum DX7s. The Mimic is a compact, user-friendly alternative to the bulky Movi Controller that conveniently attaches to the familiar Movi line crossbar with included QR plug for a convenient monitor mounting solution. Freefly Systems has come a long way regarding understanding the expectations and engineering expertise of their customers. Mimic wireless gimbal control is made possible by the Mimic’s ability to translate the remote operator’s own kinetic energy to the gimbal’s motors and sensors. As the remote operator makes a pan or tilt movement with the Mimic in hand, the gimbal makes the same motion, in tandem, from as far as several hundred feet away. So why would you need another remote solution? For high-end shoots, the Mimic is a huge asset on set, but because the operator isn’t able to tamper sensitivity settings on the fly, it is vital that the remote operator is completely locked in on his or her shot. Tuning and filter settings can be adjusted by going into the menu of the Mimic, but there are no dials for quick adjustments. If the remote operator makes any sudden, unwanted movement, the gimbal will follow suit. I don’t see where the Mimic fits in with a skeleton crew, run and gun style shoots. Fortunately, just as previous Movi models, the Movi Pro can be operated by a single operator for shoots that are a little more laid back. The DJI Ronin 2 improved their remote but kept it simple. The gimbal movements are controlled by a standard and oversized joystick that includes knobs to adjust sensitivity settings for each axis; camera record is integrated for select camera systems. The remote is large and pretty goofy, but honestly, DJI seemed to have benefitted from the Movi Controller’s anomalies and pared back the innovative remote features better than Freefly Systems was able to. DJI was careful to choose which technological advancements made a difference, and that is what they incorporated into their redesigned remote control. The Mimic also offers the world’s first focus, iris, and zoom, or FIZ, control through the remote. This is a pretty snazzy, and useful feature but with DJI’s Focus system being previously adapted to the Osmo system, I imagine they are only a few months away from releasing a product with similar capabilities. 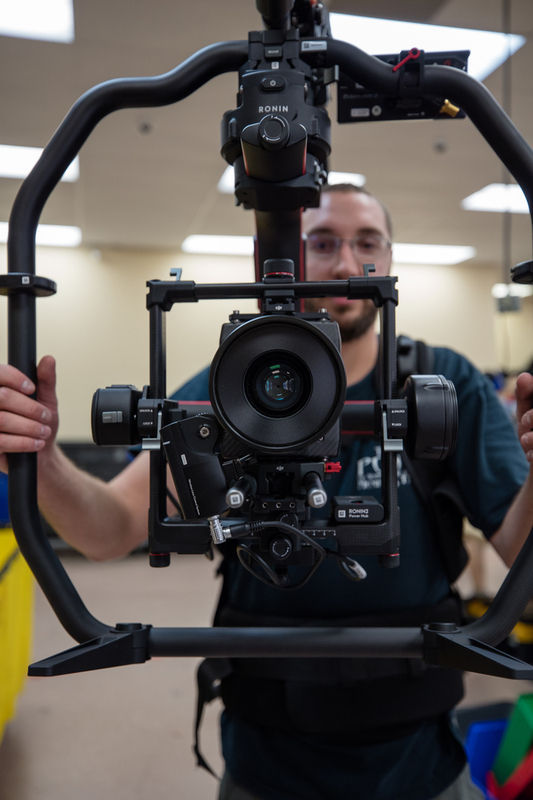 Freefly Systems initially released a Beta version of the Mimic, but now that they have moved past the prototype, they promise to build out the consumer model even more. I like that Freefly has moved to a more scientific, calculated approach to their remote but I know the best is yet to come. 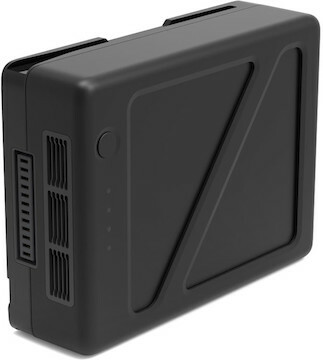 Both DJI and Freefly Systems have struggled with battery design in previous gimbal models. To keep the gimbal packages as lightweight as possible, the original Freefly Movi batteries were intentionally designed without built-in safety circuitry. They are prone to swelling when excessively charged and pose severe fire risks if not handled correctly (trust me on this one, I almost set the Lens Rentals tech room on fire once). Fortunately, the Movi Pro was designed with a safer, dual hot-swappable battery system. These batteries are still pretty compact considering what they are rated to power and can be easily installed or removed from the gimbal with a convenient release system, rather than the previous design that required the operator to secure the battery in its cage with an awkward rubber band and connect and disconnect leads. 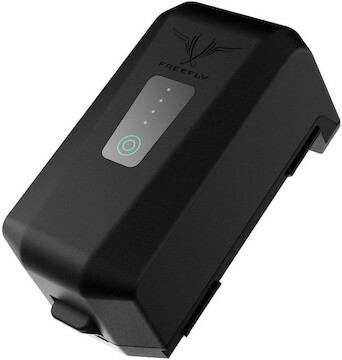 The Freefly Movi Pro battery only lasts about an hour when powering a camera and accessories. The Movi Pro offers a single camera D-Tap port along with a spine and tilt d-tap port for powering accessories, and a powered USB port built into the tilt axis assembly. The batteries feature a “fuel gauge” life indicator, meaning no more guessing how much juice you have left in your battery when shooting with a Movi system. DJI’s Ronin 2 shares a battery with their popular Inspire 2 drone system. These batteries are large and utilize an eject button for install and removal. Due to the battery compartment layout, removing a battery is likely a two-handed activity, making the design slightly less user-friendly than the Movi Pro. 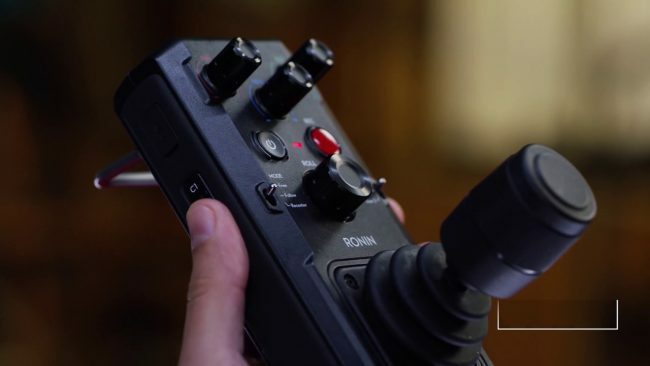 The Ronin 2 features a powered hub for powering accessories like the DJI Focus and wireless video transmission products, as well as dedicated camera power port for Red Digital Cinema Camera and Arri’s Alexa Mini. Like previous models, the Ronin 2 also offers d-taps built into the gimbal. When using both batteries, a camera, and accessories, the Ronin 2 can operate for approximately 2.5 hours on a single charge. This rating is based on dual batteries, rather than a single, meaning the rating isn’t a vast improvement over the Movi Pro’s rating of an hour per battery. Each Ronin 2 battery charge in approximately 30 minutes more than its competitor. My biggest concern here is DJI’s overachieving attitude toward developing “intelligent batteries” that are shared across more than one product line. In the past, the intelligent batteries have flashed errors that had no impact on performance but were the source of worry for many operators. With the Ronin 2’s cell being the same as a drone, any bugs discovered will probably be slow to be fixed, as firmware updates must be carefully planned to support two unique shooting platforms. The Movi Pro Handheld Bundle requires some quick assembly out of the box. The Movi Ring Pro, features two fiber reinforced feet that once installed, are fixed at the base of the ring, allowing it to serve as both a tuning stand and operator handle. Once the feet, optional grips, and top handle are installed using the supplied hex keys and screws, the gimbal attaches to the ring by way of Freefly’s popular toad in the hole quick release system. Like previous models, the DJI Ronin 2 arrives with some assembly required. The ring is made up of a lower portion that features retractable feet for support and a top bar that connects to the base using two well-constructed locking collars. Even the battery compartment requires installation. There are two adjustable grips that are similar in design and identical in function to grips on the Movi Pro. Weighing just under 15lbs, the fully assembled gimbal features an expansive camera cage that supports a camera configuration up to 30lbs. 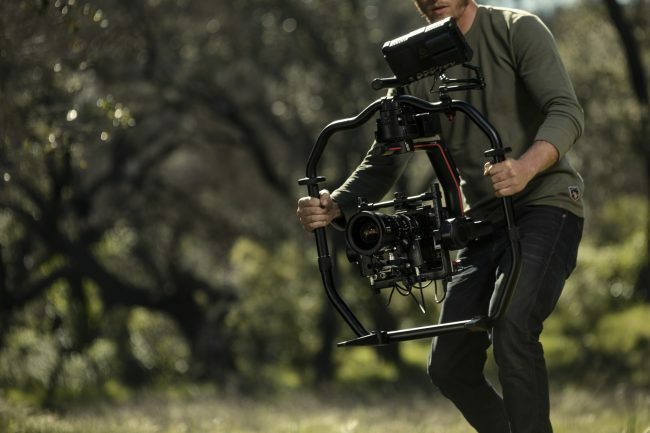 Is the DJI Ronin 2 the Freefly Movi Pro killer? Probably not. Even with all of the Ronin 2’s remarkable innovations, DJI failed to check off a few boxes that happen to be the boxes many people consider most important. For the first time since the release of the original Ronin, DJI has failed to undercut their competition’s MSRP. Knowing that price point wouldn’t be where the Ronin 2 attracts users, DJI packed in enough features and upgrades to make a gimbal operator’s imagination run wild with possibilities but may cost them the loyalty of operators who have relied on DJI to create gimbal models comparable to Freefly Systems, at an impressive discount. Another downfall of the Ronin 2 is its massive construction that comes with a severe physical toll. The ARRI and Red integration is fantastic but impractical because you can’t put two cameras on one gimbal. 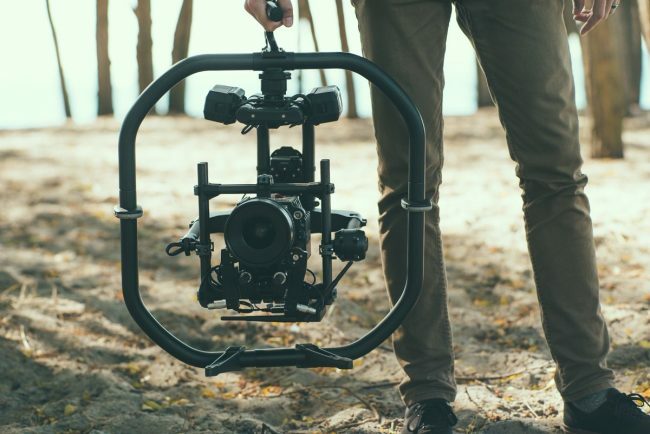 This feature is sure to garner attention from professional users, but with the gimbal alone weighing approximately fourteen pounds, more than twice that of the Movi Pro’s six-pound Handheld Bundle, operators will need to utilize a support vest, like the EasyRig Vario 5 with Flowcine or exoskeleton. 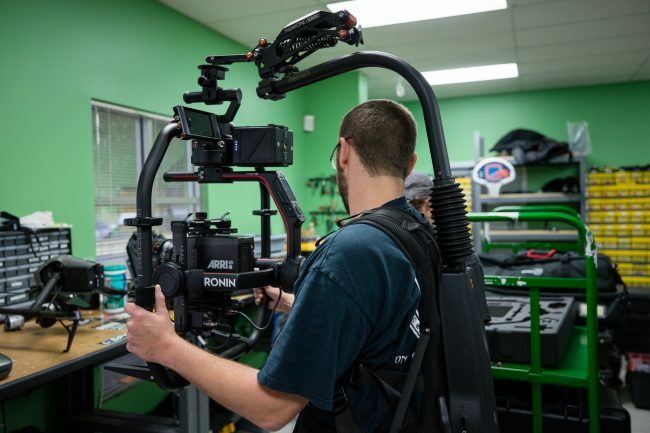 For handheld operation, the Ronin 2’s camera package weight capacity becomes a moot point when few operators could fathom shooting with a 45-pound rig for a full production day without the added costs of support equipment. Additionally, there is little mention of the Ronin 2’s minimum payload. Advertised as being compatible with DSLRs, I found the tilt axis nearly impossible to balance using a Canon C200B and 40mm pancake lens. I suspect most users will want at least 4-5 lbs in the camera cage for optimal performance. In defense of the Ronin 2, it is a fantastic machine, with powerful, nearly silent motors that can boot and initialize in a matter of seconds once balanced, regardless of how complicated your rig might be. The Ronin 2’s built-in balance test is a camera rental house’s tech team’s dream come true because we no longer need to explain how to check for your camera package’s balance, given that the gimbal can run the test itself. DJI’s newest addition is a game changer for those up to the challenge of learning a new design and enduring the physical feat of operating this Goliath gimbal. Unfortunately, for many people, the gratuitous payload is unnecessary for a more expensive rig. So what’s your take? Are you ready to take on the challenge of these top handheld stabilizers? My name is Ally and I am a Senior Video Technician at Lens Rentals. I’m a freelance veteran in almost every production department and a total gear nerd. When I’m not producing or directing commercials and music videos, I like to take advantage of my free time by oversharing pictures of my dog on Instagram. We took a follow up poll of 10,000 DPReview users and your post above and came up with the following data. Yeah, don’t you just hate it when people flounder tying to use the word “score” correctly??? I found this article both informative and enjoyable. I am seriously upgrading to one of the two gimbals compared in the article. 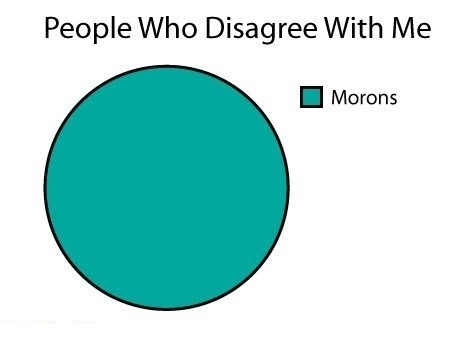 I do not understand why you think people would have “already made up their minds or are using something better.” Do you have any statistics to back up your claim? We have pretty high demand for our gimbals based on our video tech’s experiences. While the article may not apply to everyone, quite a few people would find the information provided extremely useful. No one doubts your counting ability. Or your choice of words. I’m serious, it’s probably a nice round score of 20. The Glidecam HD4000 is actually a really solid, mechanical stabilizer. It doesn’t get much attention these days because it isn’t super innovative compared to the likes of Movi or Ronin but it is great for smooth tracking shots. Before I got into Movi, I shot on glidecam handhelds and loved the results! Don’t even try it buddy, i’ve been writing for money longer than you’ve been alive, AND I’m married to the greatest copy editor on the planet. “Score” in the singular means 20 or about 20. When you add an “s” at the end and make it “scores” that’s when it refers to an undefined large number. Are there any recommendations for good versions that aren’t as expensive? I am starting to learn and shoot more video. I don’t know what to get but don’t want to spend more than 6-7 hundred. Also love your blogs, although I don’t understand a lot of what you post ? If Abe Lincoln was able to see states of affairs from the grave, I think you’d he hard pressed to find him reading reviews of gimbals. And I think a lot of other things right now would be causing him to roll more than this. Secondly, if you look up the definition of score, you’ll see that it is defined as “a large amount or number of something”…so while Lincoln might be rolling, linguists are not. I’d say it’s about 20 when you tally them all up. Please do more archaic articles that only a few people can relate to and those people have already made up their minds or are using something way better. When you say “a score of levers and knobs,” do you actually mean a score, i.e. 20? Or just a lot?